Discussion in 'In Testing & Test Server Updates' started by Kaitheel, Mar 15, 2019. Kaitheel, Uwkete-of-Crushbone and Rosyposy like this. “I tested the new quest 'Pot Luck' and everything worked fine, although I do have a couple suggestions regarding the white heather. They were very hard to see, even when zoomed in first person and they were not that plentiful. I think it would help to make them a bit bigger and a bit more plentiful. Concerning the reward for the quest the vulrich pet, he placed fine, resized fine, and his animations worked fine. I'm having an issue even finding the white heather. I didn't have a problem with theheather myself. The nodes are small, smaller than regular bushes, very very white with a blueish glow. I think they were very beautiful. Uwkete-of-Crushbone, Kaitheel and Cyrrena like this. You are correct. Edited my post. Pijotre, Cyrrena, Uwkete-of-Crushbone and 2 others like this. Can we PLESE , please have at least a merchant on Kaladim ? I really need some pink elephant's. Cyrrena, Uwkete-of-Crushbone, Rosyposy and 1 other person like this. 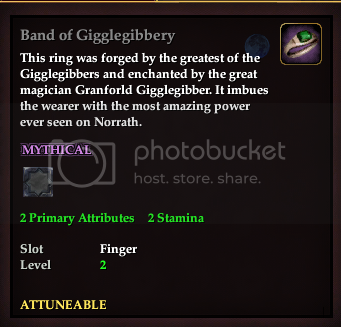 It's too late to do so on Test for "April Fool's" (these last few days), but can we please get another zone other than just Enchanted Lands for that third of the new collection (Prankster's Novelties: Bubble Pipe, Chattering Teeth, Woven Finger Trap)? Like, say, New Halas as well? They're extremely spread out in EL, they have to compete with the default collection bits if one has some way of tracking nodes, and they're also competing with the Pies, which only show up in EL and Sinking Sands. It was really nerve-wracking trying to find all the blasted Woven Finger Traps I needed for my gang of Hordelings on Test in time. Pijotre, Breanna, Cyrrena and 1 other person like this. For the Highest of Silly Days, could we get a merchant that sells the recipe books from all the holidays? Uwkete-of-Crushbone, Pijotre, Schmetterling and 2 others like this. owe was hoping we would get a merchant on Kaladim like we did on Stormhold and Deathtoll and Fallen Gate. Cyrrena and Uwkete-of-Crushbone like this. “ owe was hoping we would get a merchant on Kaladim like we did on Stormhold and Deathtoll and Fallen Gate. Too soon after the server opening - even the servers you mentioned didn't have any world events this soon after coming up, unless I am misremembering. Cyrrena, Uwkete-of-Crushbone, Breanna and 1 other person like this. If you want to experience the live events, come back to live servers. TLE servers are meant to progress from the beginning, not have full blown world events. Mirt I am playing on almost all servers anyway , including the test server and the euro server. I can also run those festivals on Fallen Gate I just wished there were more people around. Kaitheel, Cyrrena, Uwkete-of-Crushbone and 2 others like this. Another issue the gear that drops in the occasional ornate chests on the patchcraft creatures still has a max level of 95. Seems that could use a bump as well. Hard to test as they are not common, but I got 2 level 95 items from 2 chests doing this on an unmentored level 110 char. Cyrrena, Rosyposy and Uwkete-of-Crushbone like this. It's apparently not the stats (though some stats magically "improve" when you Attune the items, not when you're just Examining them, I've noticed...), it's the category of item: can't you see it's MYTHICAL? Pijotre, Cyrrena, Breanna and 1 other person like this. Okay, this won't work for decorating inside a house: \aITEM -162248321 742402774:Vibrant Bristlebane Banner\/a -- The thing is whipping around like its in front of an oscillating fan. Can we get a static version that just hangs there for next year, pretty please? Kaitheel, Uwkete-of-Crushbone, Breanna and 4 others like this. “Okay, this won't work for decorating inside a house: \aITEM -162248321 742402774:Vibrant Bristlebane Banner\/a -- The thing is whipping around like its in front of an oscillating fan. I feel like I live in a wind tunnel from March through November every year!! Uwkete-of-Crushbone, Breanna, Pijotre and 1 other person like this. I would like the killer bunnies back too! Uwkete-of-Crushbone, Breanna and Rosyposy like this. The white heather! The most gorgeous white heather! I am speaking of course of the items to be gathered in the final step of the new Pot of Luck quest. Can we please please have White Heather as a house item? Blue sparkles and all? I'd go rake up hundreds of coins to pay for those on an event vendor!!! Kaitheel, Uwkete-of-Crushbone, Cyrrena and 3 others like this. Uwkete-of-Crushbone, Cyrrena, Breanna and 1 other person like this.